The science and art of designing and constructing buildings and other physical structures has been of man’s interest since his very beginning. Architectural works have cultural rooting and symbolize the thinking of the society. When we look at the constructions of old days, we see wonders built by men with no technology. These wonders built after dedicated efforts of decades stand as a symbol of admiration and amazement. I have listed out a few of them. Coral Castle was designed and built by Edward Leedskalnin, a 5 Feet tall man, weighing 100 pounds and suffering from tuberculosis. He was jilted by his 16-year-old fiancee Agnes Scuffs just one day before their wedding. Heartbroken he decided to leave for America and build his own home. He states that magnets cured his tuberculosis. He purchased a land in Florida from Ruben Moser and started building his own castle. He spent 28 years building his home and allowed no one to visit him and his home. He had chosen this location because it was a remote area at that time with no development. In 1923 he named the castle Rock Gate Park. The Castle remained in Florida City till 1936 until he heard of some development in the area and decided to move 10 miles north from Florida City. He moved his castle with him too to it’s present location. Leedskalnin continued to work on the castle up until his death in 1951. The castle is built from several megalithic stones (mostly limestones formed from coral) each weighing in tons. It is amazing how a single person with low physical strength and suffering from a disease built such a masterpiece with the mere use of primitive tools. The grounds of Coral Castle consist of 1,000 tons of stones found in the forms of walls, furniture, carvings and castle tower. The two story castle tower served as Leedskalnin’s home. The walls were made of 8-foot high pieces of stone. He made an accurate sundail, a Ploaris telescope, a barbecue pit, a fountain, a water well, heart shaped table, bath tubs, royal throne, 25 chairs, chairs resembling crescent moon, a star shaped healing point, beds and a table in the shape of Florida. In his book, A Book in Every Home he expressed his love for his fiancee and declared the castle a gift for his “Sweet Sixteen”. He became ill in December 1951 and died of stomach cancer. In January 1981 Coral Castle, Inc. bought the castle from a relative of Leedskalnin for $175,000. In 1984, The National Register of Historic Places added the castle to it’s list of historic places. 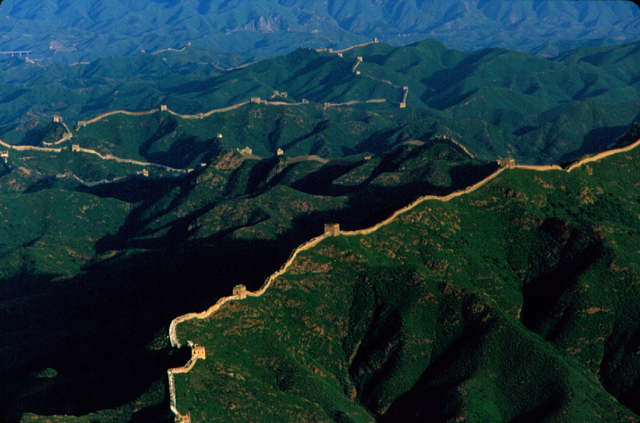 The Great Wall of China is the largest construction ever built by man. It was built over 2000 years ago. The construction started in 5th Century BC. It was built originally to protect the northern borders of the China from intrusions. Since then, several walls have been built. Collection of all such walls is referred to as The Great Wall, which has been rebuilt and maintained from the 5th century BC through the 16th century. One of the most famous is the wall built between 220–206 BC. This structure has been built by generations. According to some historians, around 300,000 soldiers and 500,000 people participated in the construction. The beautiful wall took the life of many people and many people are buried under the wall. It costs the lives of more than 1 million people. It stretches approximately 6,400 km (4,000 miles). The wall is 25 feet tall and from 15 to 30 feet wide. Taj Mahal described as “A tear drop on the cheek of time” by Rabindranath Tagore is a finest example of Turkish, Persian and Mughal architecture. The Mausoleum was built by Mughal Emperor Shah Jahan in the memory of his beloved wife Mumtaz mahal. The construction began in 1633 AD and 20,000 skilled craftsmen from allover the subcontinent and the neighbouring countries worked for 17 years to complete the monument. The chief architect was Ustaad Ahmed Lahori. The main dome of Taj Mahal measures about 110 yards in circumference and is about 107 yards above the ground. The material was brought in from all over India and central Asia and it took a fleet of 1,000 elephants to transport it to the site. Taj Mahal’s construction costed 50 lac rupees at that time. Taj Mahal is decorated with Gold, Rubies, Turquoise, Lapis lazuli, Sapphire and Diamonds. The verses of Quran are written in the passages in beautiful calligraphic styles. Another beauty of this amazing construction is that it is symmetrical and one side mirrors the other side. The mesmerizing beauty of the monument makes it special but what makes it more special is love. This Mausoleum is one of the 7 wonders of the world. The leaning tower of Pisa, also known as the Tower of Pisa, is a bell tower next to the Church of the city of Pisa in Italy. The tower is 186.27 feet tall from the ground towards the lower side and 186.02 feet on the higher side. It is 8 feet wide from the top and 13 feet from the bottom. The Tower had 296 and 294 steps and weighs 14,500 metric tons. The seventh floor on the north side has two steps fewer. The construction of the Tower Of Pisa took 177 years. It has three different sections. The first floor was constructed in the year 1173 and it was in the year 1178 when the tower had the thirds floor, when the tower started to sink. The tower leans on one side because of a three meter foundation on unbalanced soil. The flawed design has become one famous example of architecture. War halted the construction for an entire century. Giza is a city in Egypt on the bank of river Nile. After Cairo and Alexandria, it is the third largest city in Egypt. The Great Pyramid was the tallest building in the world until the 19th century. The length of the side of the pyramid has reduced from 754 feet (230.33 meters) to 745 feet (227 meters). The Pyramids of Ancient Egypt were built as tombs for Kings (and Queens). Amongst 93 Pyramids in Egypt, the most famous ones are those at Giza. All work was done without machinery.were needed 40.000 people. We have to note that the Egyptians did not know then wheel and all work is done without any machinery. It was constructed using around 2,300,000 limestone block. Each block weighed on average, 2.5 tons. Building this in 20 years required installing approximately 800 tonnes of stone every day. It is made of 2.3 million blocks which means more than 12 of the blocks must have been moved into place each hour, day and night. It took the lives of millions of poor people as they were treated savagely by the Pharaohs. the information u’ll provided to us it not enough . we want more information,images.